Our Plate Graining Machine is heavy duty and strong structure to bear the vibrations of the suspended machine on thick and strong chains. The bed tilting arrangement of it, is to empty out the graining balls. 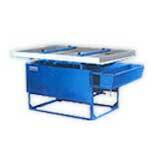 Our heavy duty plate graining machine is available in 41â�� x 51â�� size. Our company is well known as a plate graining machine exporter because of the quality we provide.